Secure registration method for shareware applications. Is there a better alternative to AquaticPrime? Is AquaticPrime really the best app in Libraries category? 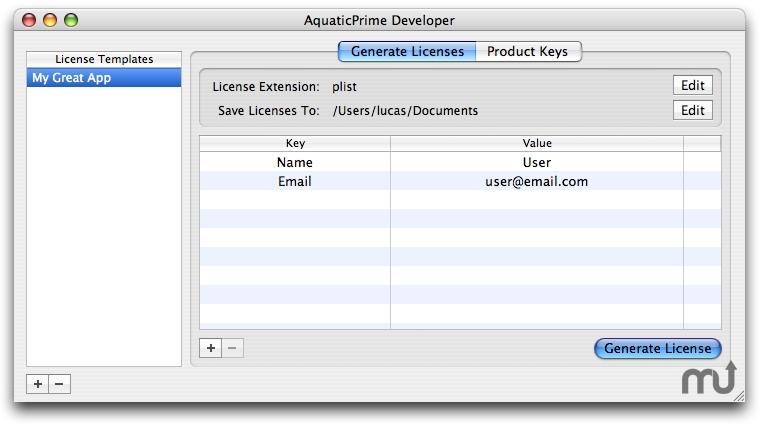 Will AquaticPrime work good on macOS 10.13.4? The AquaticPrime framework is a secure registration method for shareware applications, released as free open-source software. AquaticPrime uses RSA encryption to provide excellent security - it is computationally infeasible for an attacker to generate fake serial numbers, despite the entire framework being open-source. Improved the configuration for PayPal, so no modification of the PayPal payment processing script is required. Added an experimental STL implementation. AquaticPrime needs a rating. Be the first to rate this app and get the discussion started!